Nestling in the shadow of Mont Blanc - Europe’s highest mountain at 4807m -Chamonix lives and breathes mountain history. Chamonix has long been hailed as a mecca for climbing and mountaineering with bearded mountain men in de rigour battered alpine gear seen striding around town and regaling unfortunate listeners with tales of leaping crevasses, dodging rock falls and climbing peaks. There’s Mont Blanc to be summated, the north face of Les Drus to be tackled and Les Grands Jorasses to inspire. Indeed, Chamonix first came to prominence as a summer tourist destination in the 19th century and the first cable car opened at Le Brevant for summer walkers. Now Chamonix is just as famous for its winter activities as one of the most challenging ski resorts in the world including the world famous Vallee Blanche - Chamonix’s most well known off piste adventure. Starting from the Aigille du Midi -one of the most visited and stunning panoramic view points in the world - and with the services of a guide, you can ski an uninterrupted 22km past blue ice formations, yawning crevasses and tumbling glaciers. A 2.8 km vertical descent through some of the most amazing alpine scenery. Then of course there’s Les Grands Montets with its legendary off piste and glacial variants, the Aiguilles Rouges and the Pas De Chevre. There are an enormous array of activities for the visitor enjoy. With an impressive sports and swimming complex, beauty salons, spas, golf, ice rink, cross country skiing, paragliding, husky sledding, guided snowshoeing, cinema, museum, casino and weekly market with fresh local produce; and a plethora of shops, designer boutiques, bars, restaurants, terraced cafés and night-clubs, Chamonix offers a combination of skiing, old town charm, après ski and shopping, which few resorts can match. There are also plenty of options when it comes to dining out. All tastes and budgets are catered for from the obligatory burgers at Poco Loco, to traditional savoyarde fondues at L’Atmosphere and nine course gastronomic delights at the two stra Michelin Albert Premier. 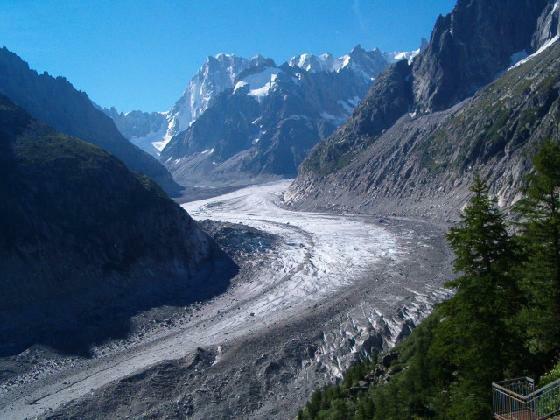 Or, within 20 minutes, you can nip under the Mont Blanc Massif through the Tunnel Du Mont Blanc and arrive in Courmayeur in Italy with it’s own very special regional varieties. And, if you tire of ski gear shops, salami and penknives then Annecy is a mere hour away - the Venice of the Alps - with its beautiful old town and glistening lake. And did I mention the shops? This is without mentioning the stunning high mountain scenery: the tumbling glaciers, soaring Aiguilles, one of Europe’s highest cable cars - the Aiguille du Midi at 3842m - the Mer De Glace, the Merlet wildlife park and arbre adventure for kids and families and a beautiful alpine town and traditional mountain villages and hamlets dotted along the Chamonix valley. Whether you are looking for a skiing or snowboarding holiday in Chamonix, or an alpine summer holiday with mountain biking, canyoning, hiking, climbing and more Chamonix has the answers.